The snakeskin gourami as possible food and income source. The Snakeskin gourami (Trichogaster pectoralis), locally known as ‘gourami’, is one of the four gouramis introduced to the Philippines from Thailand, in addition to the ‘giant gourami’ (Osphronemus gouramy) from Indonesia. The gourami is native to the river systems of Thailand, Laos Cambodia, Indonesia, and Vietnam. In the Philippines, the gourami has been cultured in rice fields and freshwater ponds, particularly in Central Luzon, usually with fingerlings from the wild and with other fish. 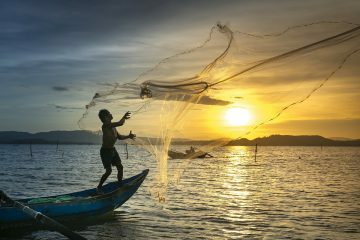 It is also caught by fisherfolk in rivers and lakes where it has become established throughout the country. 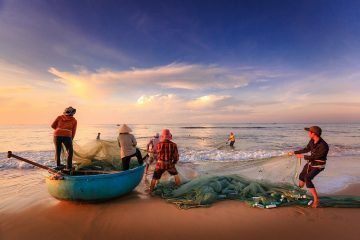 Although the fish is well accepted by local consumers, its production has not been commercialized because of the lack of fingerlings and culture technology. Commercial production of gourami is done in Thailand and Vietnam, where the fish is a favorite food item, especially in its dried form. 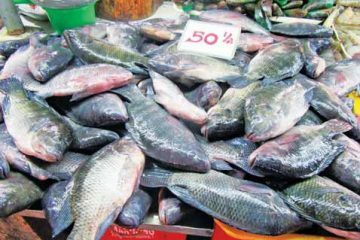 In Vietnam, for instance, the fish sells for approximately Php110 to Php150 per kilo, and is more expensive than pangasius and red tilapia. 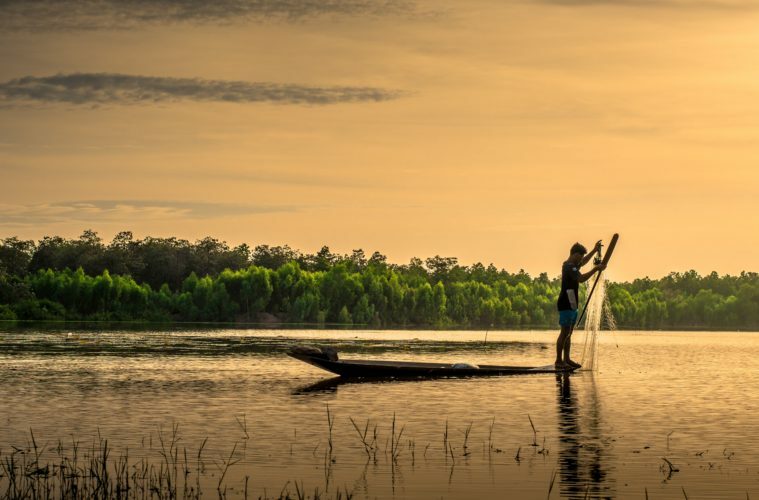 We learned about the production of gourami in the hatchery and its intensive culture in grow-out ponds from Cargill Vietnam aquaculture specialist Nguyen Tan Duy Phong in his paper published in Aqua Culture Asia Pacific. In the hatchery, the mature gourami breeders— about six to a kilo—are spawned at a ratio of one male to one female in 500-liter tanks with 40 centimeters of water from April to July. The males are bubble nest builders and have pointed, longer dorsal fins than females. With induced breeding, the females are injected at the base of the dorsal fin with 5,000 IU (international units) of HCG (human chorionic gonadotrophin) while males are injected at a dose one-third of that given to females. Spawning occurs 15 to 20 hours after injection. The fertilized eggs are transferred to another tank where they hatch 22 to 24 hours from spawning at water temperatures of 28 to 30 degrees Celsius. With aeration and anti-fungal treatment using potassium permanganate at 3 ppm (parts per million), the larvae are reared to the free-swimming stage (fry) three days from hatching. The 3-millimeter long fry are then stocked at the rate of 1,000 per square meter for 60 days of rearing in outdoor nursery ponds that have been fertilized for zooplankton growth. Artificial fry feed is also given. The fry grow to fingerling sizes of 250 to 300 pieces per kilo and are sold, after being graded, at R2 to R6 each, depending on size. 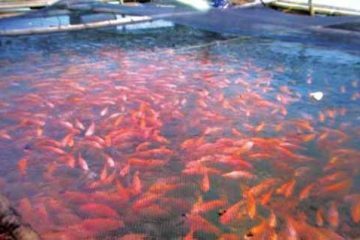 For grow-out in ponds that range in size from 0.5 to 2 hectares with water depths of 2 to 2.5 meters, the gourami fingerlings are stocked at 1,000 per square meter in March to April. The ponds are fertilized with diammonium phosphate at 20 kilos per hectare for the first month of culture. Feeding with commercial feeds is done using a starter feed with 42% crude protein in the first month followed by a feed with 30 to 35% crude protein in the following months. The fish are fed 5 to 8 times a day during the first month and three times a day in the succeeding months. 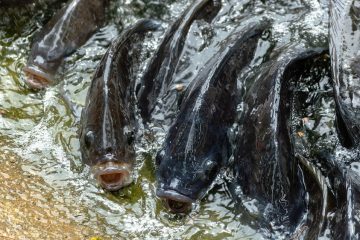 Since the gourami is an air-breather like the mudfish and catfish, it can be stocked intensively in the ponds without artificial aeration. Water exchange in the ponds, however, is applied starting at the second month of culture for maintaining good water quality and preventing disease outbreaks. The gourami is harvested after 5 to 6 months when it attains market sizes of 120 to 140 grams each. The fish can be partially harvested using nets or totally taken out by draining the ponds. It has a survival rate of 80% to 90% and feed conversion of 1.9 to 2.2. 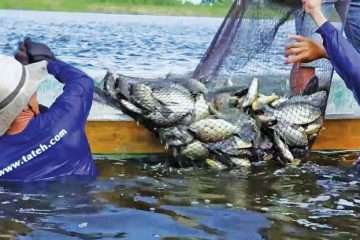 With yields of 20 to 30 tons per hectare and production costs of Pho79 to Php88 per kilo, the net incomes can be Php410,000 to Php1,450,000 per crop per hectare with an ex-farm price of Php104 for the fish. For more information, Nguyen Tan Duy Phong can be contacted via phongx9@gmail.com.